Final nine moments with crowds are the most exciting and the most memorable. 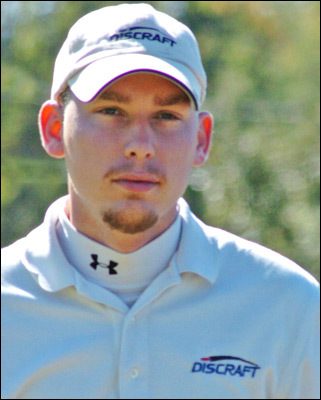 At my first pro A-tier event, The 2003 Michiana Open I played with some of the best players of the world and competed. In 2005 Michiana Open final nine there was a hole nobody thought anybody would deuce. It was probably 575 feet with no direct route. There was a little elevation and a lot of trees. I threw a big hyzer over the road and when it was time to putt I stepped up and made one of if not the longest jump putts of my career. The crowd went crazy as I jogged the 120 feet to the basket. Completely exhilarating. Keys to throwing good backhand rollers: You need to be able to get the disc to turn over and roll so in your run-up arch your back and point your elbow upward, and than roll your fore-arm over to come over on the disc. You need to use the proper disc for the job, such as something under stable like the Avenger SS or the Express. You need to play the flight of the disc. In general it is going to take a left to right motion for a right hand thrower. You also need to look at the fairways to make sure they are not littered with sticks, gravel, or other things. You need to practice to get a feel for the shot. Repetition will teach you how it is going to roll, and what is needed to make the shot work for you. Elevation can make a big difference in throwing rollers, so make sure you play the change in it. When rolling one uphill you normally need to turn it over a little more versus when throwing a roller downhill you normally need to turn it over less. When you need one to go shorter, lay the roller down quicker. When you need it to go more right, turn it over a little more by laying it down with more of a vertical angle. Key is to practice and get some repetition in so you know how it is going to work. Spend more time thinking about control instead of distance. Lots of newer players lack confidence too, and confidence is key to making great shot after great shot. Don't be afraid to ask for help, and don't be afraid of change. Remember the little things in the game, they all add up. Most top amateurs have the skills needed to play pro, it's a matter of consistently bringing those skills to compete in a tournament. It's not who has the game that wins, it's who brings the game to the course that wins. Go to a local pro if you can for help on tweaking your form. When the form is down the distance should come. A farther reach back, and follow thru will also help get extra distance. The mental game is probably the most important part of the game and nobody talks or works on it. Read some books, it might help. Use your brain: it is your best tool to getting better at this game. Making long putts: There are many keys to this. First a good smooth weight transfer from the back foot to the front foot is key. Another key is to not have too much loft in your putt. If you have too much loft in your putt you can't possibly make long range putts. It is key to have a good amount of forward momentum as well as arch in the putt to get the most out of the flight. Once you get everything together you will be able to putt farther than ever and this is not even including a lunge or jump, which can also add distance. How to throw anhyzers: Many new players as well as long time players have trouble throwing anhyzers. One key is to arch the back a little when throwing, which allows you to get your elbow higher which allows you to than follow through rolling your forearm over when you snap. If you do all this you will successfully be able to throw an anhyzer out of your hand. Diversify your game: Change up your practice routines, the courses you play, the shots you make, and the discs you throw from time to time. This will help you become a better player. Why do I say this? Because there is times when you will find yourself in places you haven't been before, and there will be times when you will need to make shots you have never made before. By diversifying your game you will be stronger and more ready to make those shots. Practice routines should change from time to time and should go along with practice on the course. You should not play the same course all the time unless it is your only option, no matter how good the course is. If you are stuck with the same ole course switch up the shots, try different disc's, or throw some shots side arm instead of backhand. When I am saying throw different disc's, I am saying stay with what is in your bag, and switch it up. Step up to a driver instead of a midrange maybe and try to work the disc by taking some power off. Learn to throw backhand, forehand, roller, and overhand shots. All of these things will make you a better player that is more prepared for the course. Find more information about Matthew and his game in this article. (170+) I have never been happier with the production of a distance disc. This is the best distance disc on the market, plain and simple. It's super fast, very controllable and just a perfect addition to the bag. It goes far, fast! (170+) The Force is a great, fast, consistent, overstable driver and is key to my bag. The Force also can handle the wind and works great for sidearm shots. It flies very far and is very reliable, and is a must have in my opinion. (170+) One of the most controllable, consistent drivers on the market. It is overstable which makes it perfect for shots into the wind, skip shots, forehand drives, and hyzers. They take a while to beat up, but once they do they are still a great disc. They get a little less stable and get little more glide which means they will fly a long way. This disc is a must in the bag for me, and is one of my go to disc in all kinds of situations. (170+) This has been a great addition to the bag. Manits will fly really straight without a ton of power. It is controllable, and a go to driver for me when the fairway is tight and I need that straight flight. (170+) This is my go to disc on anhyzers and rollers. The Avenger SS is one of the fastest and best discs for beginners and I use it all the time. I throw it for softer touch control shots, long straight shots, long anhyzers, short and long rollers, and hyzer flips. This disc is a must in the bag for me, and is one of my go to disc in all kinds of situations. 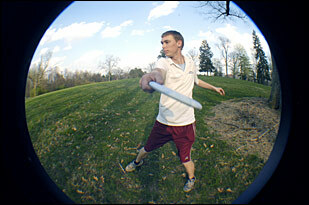 (170+) This disc is the most controllable disc in my bag. It flies as straight as an arrow. It is versatile though too, If you want a slight hyzer or anhyzer it works great too. A great addition to the Discraft line. (170+) This is one great mid-range disc. This is my go to disc in the open under 350 feet. It is so consistent and has a great flight. It flies straight and than fades near the end of it flight. It has just enough fight to fly good in any but the strongest winds. (170+) One of the straightest flying discs ever made. It is has amazing glide and will normally go farther than what you think until you get used to it. The Comet is a great control shot disc as well as anhyzer disc. I use this disc for most of my medium to short range anhyzers. (170 - 180) The Drone is a great specialty mid-range disc. There is nothing better for short controlled hyzers, side arms, or throwing in the wind. This disc can stand up to the strongest winds out there and is a must have for those playing in the wind. (170+) A great feeling hard putter that is excellent for everything! It works great for driving, approaching, and putting. This is a must in the bag for me, and is what I would use in most short-range situations. Burlington, KY A challenging, beautiful par 72 course that is continuously being worked on and improved. Portersville, PA A challenging, beautiful par 66 course that demands a variety of shots to shot the best possible scores. Louisville, KY A challenging course that has a variety of holes which will challenge all aspects of your game. Independence, KY A beautiful well maintained course that has a good amount of elevation. It is not the most challenging course but is very fun to play at.